The Hubbub Club joins Circus Maximus on Saturday, August 8th at 755 After Dark! 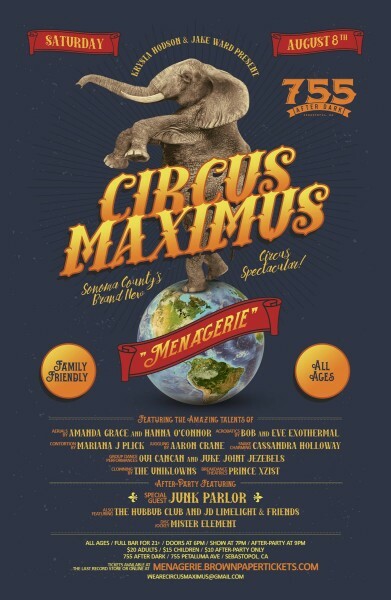 Come witness the second amazing show by Sonoma County’s Brand New Circus Spectacular, an ALL AGES / FAMILY FRIENDLY experience! Aerials, juggling, contortion, acrobatics, breakdancing, bellydancing, can-can, snake charming, clowning, magic, music, and more! The musical after-party features THE HUBBUB CLUB, clowny vaudevillian tunes by JD LIMELIGHT & FRIENDS, circusy dance beats by disc jockey MISTER ELEMENT, and a blistering grand finale performance by San Francisco’s premiere gypsy rock rascals JUNK PARLOR!!!! There will be fun foods available including popcorn, hot dogs, nachos, and pizza, plus a full service cocktail bar / draft beer selection for 21+ w/ID.